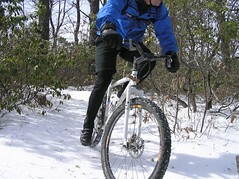 When it comes to winter mountain bike riding, snow and ice seem to go hand and hand. 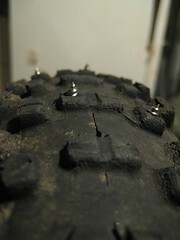 And if you've got ice, you need studded tires. The options are limited and expensive. Do you want 29er tires? Fat tires? Good luck, I haven't seen anything close to a 2.3" width or bigger in any tire diameter. Fat tires at low pressure give you grip and float in the snow. The studs handle the ice. Want a set of studded tires? You can pay a lot for commercial ones or roll your own. If you make your own you can save a bunch of money and reuse some tires that would otherwise be headed to the trash. Even better, you can pick a size and tread pattern that's not available in off the shelf studded tires. Here's how to do up a set yourself. Grab a tasty beverage, gather your materials and in an hour or two you'll be ready to roll. With the chalk, mark out a pattern on the tire knobs where you'll want the screws to go. Spread them out so they aren't too close together, but make sure you always have a stud in contact with the ground when you are riding. You should use 80 - 100 screws per tire. Too many and the tire will be a pig, too little and you won't have enough grip. You should choose big, solid knobs that will be able to hold the screw you'll be inserting. Using the block of wood to back up the tire, pre-drill the center of the knobs you marked. The drill bit needs to be a lot smaller than the diameter of the screw. Put the gloves on, things will get dicey. Swap the drill bit for for the philips driver bit and insert the screws in the holes you drilled. The screw head should be on the inside of the tire. Snug the screw up but don't drive it in to far. Ideally you just want a small bit of screw sticking out of the tire. Too much screw and they fold over when you ride and won't provide grip. After all the screws are in, install one side of the tire on the rim. Grab a tube. Cut the valve out, then cut the tube along the inside seam. Use this to line the inside of your tire and protect your good tube, it will naturally lay in place. Inflate your good tube a little to give it some shape. Insert it in the tire, making sure the tube liner covers the screw heads. 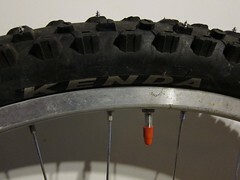 Install the other tire bead. Inflate the tire. I usually run 50 - 60% of my normal pressure. It sounds low, but it works. Low tire pressure lets you get more rubber and studs on the ground and it works better in deep snow as well. The studs won't do any good in pure snow, but when it's icy, that's when you'll want to use them. Stainless screws are best because they wear better and don't rust. If you can't get them, don't worry, any pointy sheet metal screw will do in a pinch. After a freezing rain puts an ice crust on the snow, Kevin takes the turns with ease on his studded tires.